With the cognitive computing age approaching at mind-boggling speed (before humans and technology likely will merge from about 2040), there seems to be a certain urgency in the need to familiarise ourselves with Artificial Intelligence. For translators this involves thinking about how (and if!) to integrate machine translation into their workflows. On 24 January 2018 an event on the use of machine translation in professional contexts was held at Clifton Hill House in Bristol. It had been organised by the University of Bristol in partnership with Universidad Pablo de Olavide in Seville and the ITI Western Regional Group (WRG), attracting academics, professional translators, translation companies and technology providers. The job of post-editor is a relatively new profession. Post-editing nowadays is either offered as a service in its own right or just used as a tool that is incorporated into the translation process. Post-editing has been defined in the ISO 18587 standard. 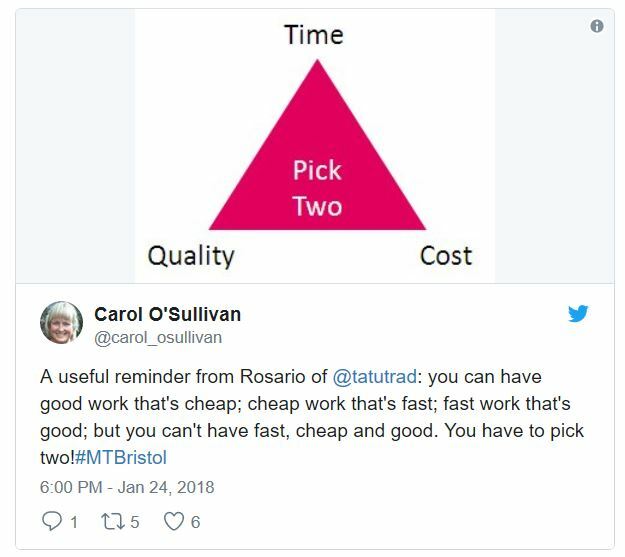 Yet, although it’s been defined and hence should be clear-cut, in practice it’s more complicated since clients tend to have different requirements. Machine translations often are over-edited, rather than under-edited. 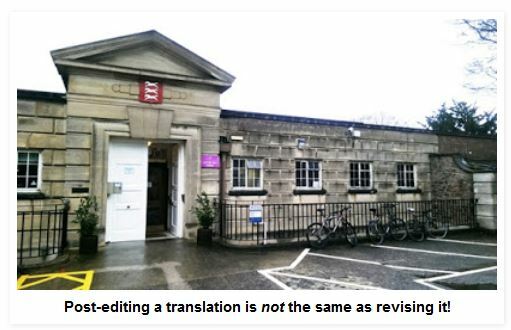 It is therefore important to note that post-editing a translation is not the same as revising it! They are two different skills. 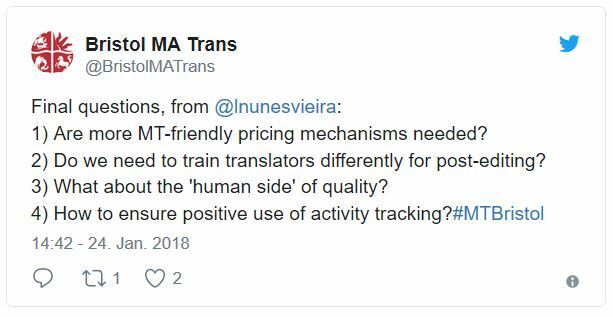 Ideally, MT should be regarded as an additional tool, or translation memory, or source of reference, which for certain projects (!) can help improve efficiency and productivity. There will inevitably need to be a move from word count-based pricing to time-based pricing for projects involving the post-editing of machine translations. There has been a notable shift in the perception towards MT among translators because it’s becoming more capable of producing results that are usable. However, feelings of uneasiness, or strong dislike, towards MT continue to persist. News headlines about advances in machine translation have led to inflated expectations by clients of what such tools can do. It’s worth bearing in mind we’re still very far from the point where the machines can take over from us! The upside of such news headlines, on the other hand, is they’ve drawn attention to professional translation and interpreting, an industry which had previously often been overlooked. There is a bizarre discrepancy between “human translators are a dying breed” headlines and the real situation human translators find themselves in: All the translators who I know are up to their ears in work. Constantly. And the demand for translations seems to be steadily increasing. Find out more about this week’s event on the use of machine translation in human translation workflows by looking up the hashtag #MTBristol on Twitter.